Caster-mounted open wire bins and highly visibility color suggest you Borrow a Big Yellow Bag at IKEA on your way into the Store®. Large bags make shopping and selection of small items easy, while oversize item selection is via Pick Card with final pickup in the warehouse. When empty these rolling bulk bins are wheeled to the back of the store to collect empty bags from departing patrons beyond the cashwraps. 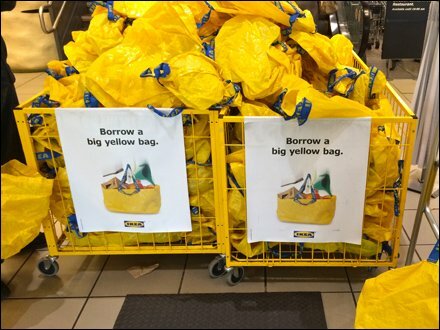 Then recycled into Borrow a Big Yellow Bag at IKEA display and use front of store.